We’re less than a week away from Christmas, friends! I’m feeling pretty merry already—how about you? Daniel and I are heading home to Massachusetts on Friday, but until then, I’ll be finishing up my 2016 projects and buying the last of our Christmas and Hannukah gifts (last of = all of them). Since sweets are everywhere during the holidays, I thought I’d give you another savory idea! 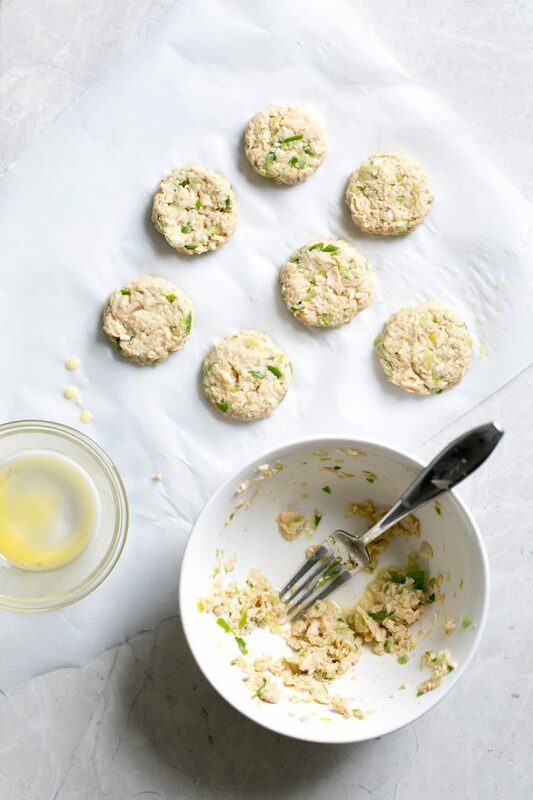 These mini salmon cakes have fresh lemon, scallions, and make use of whole grain oats instead of traditional bread crumbs. They’re cute, small—roughly the size of a silver dollar—and each one is only 49 calories a pop! Alone, they’re perfectly delicious, but topped with sweet roasted red peppers, briney kalamata olives, and tangy feta cheese, they’re popping with flavor. Rather than using raw salmon, I used something much easier and MUCH cheaper: Chicken of the Sea EZ-Open cans of Boneless, Skinless Pink Salmon. This pink salmon is wild-caught, high in omega-3 fatty acids, and the EZ-Open lid on the can makes it a snap to open and use! 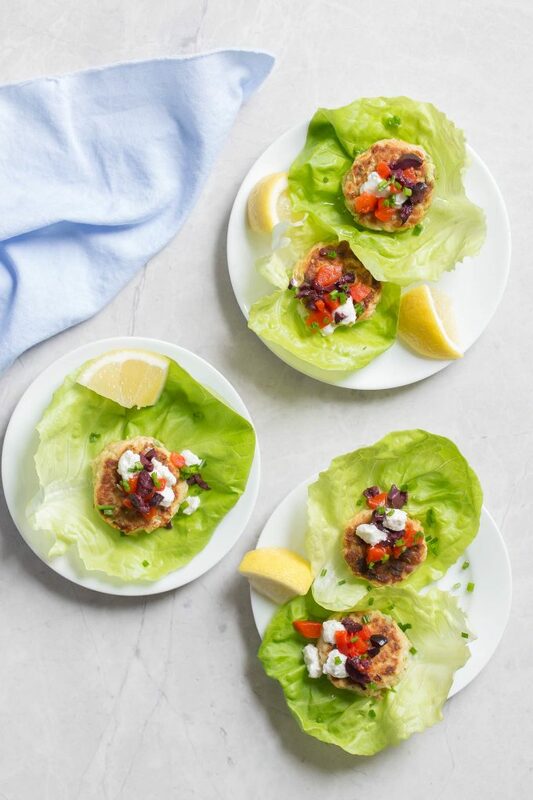 Tuck these tiny salmon cakes with roasted red peppers and feta into lettuce cups or radicchio leaves and serve them as an appetizer or snack! In a food processor, pulse the oats to fine crumbs. Transfer to a large bowl and add the garlic powder, salt, and pepper. Add the scallions to the food processor. Pulse until finely chopped. Transfer to the bowl with the oat mixture. Add the salmon to the bowl with the scallions and oats. Add the egg and lemon juice. Mix well. Use your hands to take 2 tablespoons of the mixture and form it into a small patty. Place it onto a plate lined with parchment paper or plastic wrap. Repeat with the remaining salmon mixture (you should be able to form 16 small patties). In a large nonstick skillet, heat 2 teaspoons of the olive oil over medium-high heat. Add half of the salmon cakes and cook until browned on both sides, 7 to 8 minutes, flipping halfway. Repeat with the remaining 2 teaspoons olive oil and the remaining salmon cakes. 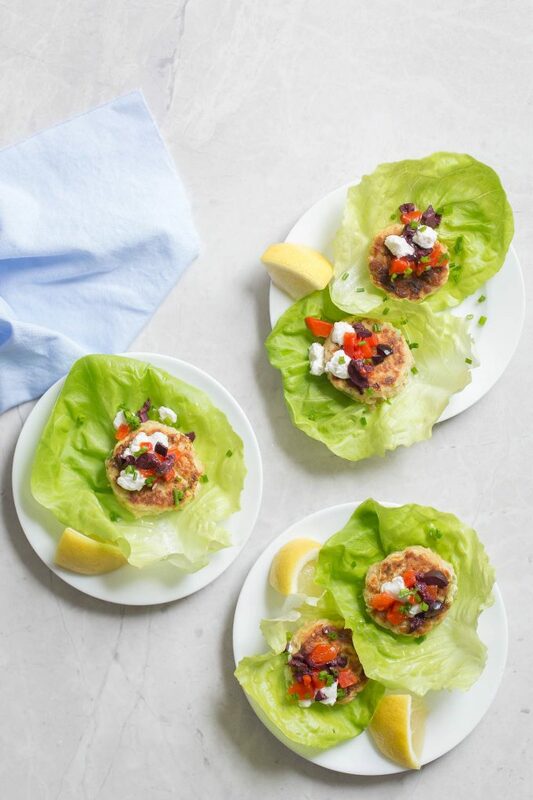 To serve, top each salmon cake with feta, roasted red pepper, and chopped olives. 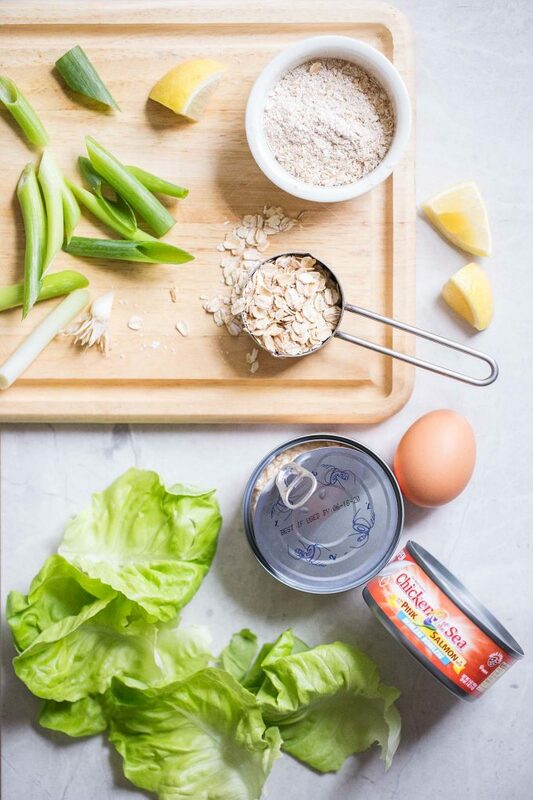 Serve on a platter or in lettuce cups, if desired.